Venetian Casino Resort – This resort believes in extreme extravagance, which is unsurprising considering that it’s the biggest casino resort in the world, bigger than anything in Las Vegas. Inside the Venetian are regions of premier shopping malls, a hotel with 3000 rooms and gondoliers that roam in indoor canals along Italian street replicas. Not to mention its generously-sized gambling floor which tops off everything extravagant about the Venetian, many claim that the Venetian is the best of Las Vegas that was transported to Asia. The Sands Macau – This Las Vegas-style casino is complete with free drinks, live bands, grand buffets and the great things associated with Las Vegas casinos. 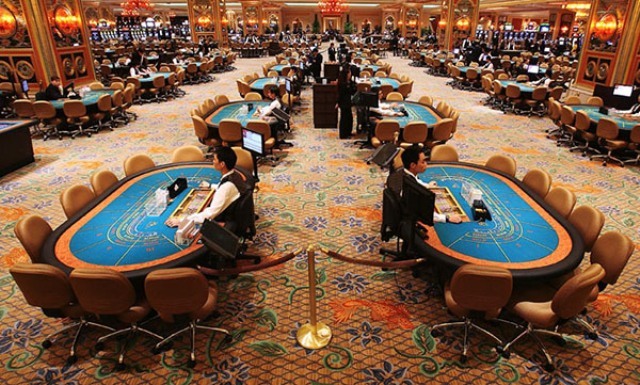 The Sands has the biggest Casino gaming floor in the world with standards set high. It has a reputation for looking after its high rollers in excessive style as well. Unfortunately, some remain rather disappointed with its main gambling hall that apparently lacks character as well as its position close the Hong Kong ferry pier, which makes it extremely crammed during the weekends. Casino Lisboa – As one of Macau’s oldest casinos, the veteran saw itself faced with a little too much competition, and thus treated itself to a facelift. In 2007, the Lisboa became less threatening and a lot brighter, and that eventually brought back its genuine Macau symbol status. Although low on the glitz and glamour, the Lisboa offers seasonal gamblers with a maze of rooms that make the Macau gambling experience oh-so-authentic. Wynn Macau – Since its opening in 2006, the Wynn Macau has made a huge splash in the Macau Casino market. Although the Wynn is much smaller than most of its rivals, it has proved to be beautiful with its award-winning designs both inside and outside the casino. The gambling world’s cream of the crop flocks to the Wynn to enjoy superior service as they engage in the highest stakes in gambling in the entire town. After all, only the best gamblers in the world would know how a real casino should roll. Galaxy Rio Casino – Although certainly not the biggest or the best, the Galaxy Rio Casino is still most enjoyable, especially for that boys night out in the town. The Rio has then attracted a certain local crowd in a less intimidating atmosphere. This male-dominated casino makes up for its lack of gaming tables with a more elegant gaming experience. With the dozens of Macau Casinos that are filling every inch of the city, it is best to narrow down only the biggest and the best of what the city has to offer. Each casino has an outstanding reason to love them even more so make your pick, take your chances and gamble until the wee hours of the morning.